I wrote Michael back and told him what happened. I am a premed student at Virginia Commonwealth University in Richmond, VA. We have (briefly) discussed your case in my class, Faith and Life Sciences. We read an article, from 2001, about your family and the Nash family, and I did a quick Google search to see how Henry was doing now. I’m glad to see he’s still doing well. I’m sorry I am unable to help financially or medically (yet!). I’ve attached a song by my band, Laden Angel. It’s titled “It Happened To A Man.” Our singer wrote it after losing many friends to car accidents, but it has helped me and many others through difficult times, and I hope it will do the same for you…should you ever need it. I wish Henry and you both all the best of luck in the future. 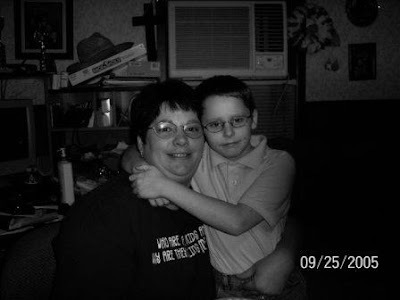 This is a photo of John Smith and his Mom from 2 years ago on his birthday. You can see what he looked like without the steroids. The Southern Civil Rights and Music Tour has come to an end. Jack is back. He is kinda tired and closed-mouthed about everything, so I'll give him space and time to tell me all about his trip. It is nice to have Jack back. They are going to film another Toy Story movie - Toy Story 3 - in 2010. That isn't as far off as it seems. Tom Hanks, the guy whose picture I took last month, will be back as the voice of Woody and Tim Allen, will again be Buzz Lightyear. I read John Smith's website and it looks like he made it through last night down there in Nashville. That's good. I am really pulling for him to get better. I just got my own call from Nashville and our Southern trekkers are visiting the XM studio that is in the Country Music Hall of Fame. I miss the people who I worked with in Nashville. They are all the nicest people. I am jealous of Jack. I told them to make sure they see all of the plaques of all of the people enshrined in the Hall. Elvis, Johnny Cash and Ray Charles are all in there; it is cool. Mom is picking up Jack later today. He is going to be a "UAM." That means he is flying as an "Unaccompanied Minor" without any grownups. I am proud of his independence. I cannot wait to hear all about the trip. Yesterday we went to Nana and Papa Sy's for a last night of Passover seder. I never heard of that before but Nana explained that it is a tradition for some people. I am excited to stop eating Matzoh. That happens at sundown tonight. Since you guys were born only 2-days apart, Rachel reminds me how old you'd be now. She is very grown up and beautiful. She sews now. I am sure she is going to be good at whatever she chooses to do. Michael is a great snowboarder and Sam is an amazing skier. All of your cousins are incredible, impressive kids. Watching them grow up is fun. During the meal last night, I was thinking back to last year when I went up to New York around Passover. I went up to help XM broadcast the Downtown Seder. I hope they keep broadcasting stuff like that and Radio Hanukkah. I like traditions, but at the same time I'd like to do a more high tech seder. I want to show videos along with the normal Hagaddah stuff. This is a video I watched right before the first seder last week and I thought it was important, especially when we are so focused on slavery and freedom and justice. I would have shown that video and this one if we had video added to the seder. There are a lot of people dying right now. It is hard to take especially when we don't know if our soldiers are still fighting for people to be free. Hey, speaking of high tech, one thing I don't understand is why they don't sell motion sensor controlled faucets and toilets for people's houses. That would save a lot of water. I only see them in airports and stadiums. Maybe one day. This little guy is a lot like you. He is a handsome kid. I love the red hair. And those guys in his bed remind me of you and your beanie babies. This is from his Mom to the Fanconi anemia discussion group. Hello Fanconi Family, I come to you to ask for your prayers. John has been admitted to the pediatric critical care unit, and was placed on a respirator today. They don't know yet what is causing the problems with his lungs, but he is very sick right now and in a medically induced coma to let his little body rest. The doctor did say that the next few days are going to be critical and will tell if he will pull through once again or not. I am not ready to say goodbye to my little one, but if the Lord is ready to call him home, I will have to accept it not matter what. I just pray that the Lord doesn't let him suffer either way. Unfortunately, even though John had a great match for his transplant he has GVHD and now is having problems with his lungs just like you did. 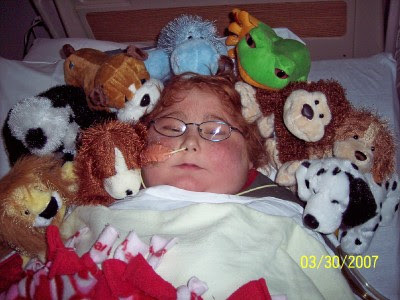 He is in the Intenstive Care Unit at Vanderbilt Children's Hospital in Nashville, Tennessee. Nashville is where Jack, Hannah, Uncle Dan and Aunt Jen are heading today. Aunt Jen went to law school in Nashville, and I used to go there all the time for XM. It is a nice town. I hope it isn't "smokey" there today. This is rough. I hope he pulls through. Here is the blog that Uncle Dan started to help us see what they are doing on their trip. Jack looks very happy. I can't wait to see him tomorrow. Sounds like they are having an amazing time. I have written you in the past about how FA patients are often really good athletes. Here's one. To watch Brian Kuell pound his groundstrokes or attack a volley this spring, one would think much of his time has been spent on a tennis court. Actually, Kuell has spent more figurative time in recent years in the woods. He is still not out of them. "There's no point in worrying about something I have no control over," Kuell said after a recent match. "It's wasted energy, if you ask me." The 18-year-old Kuell is a senior at West Shore Junior/Senior High and the No. 2 singles player for the Wildcats. He is 7-2 in singles -- he lost one match subbing at No. 1 -- and 9-0 at No. 1 doubles with the squad's top player, senior C.J. Johnson. Those are good credentials, ones that rise when Fanconi anemia, which Kuell has, is considered. Because of that inherited disease, Kuell missed not just his junior-year tennis season, but that school year. He spent nine months receiving treatment at the University of Minnesota hospital, a stay that ended early last year. "Last year at (about) this time," said Kuell's mother, Carol, "we didn't know if he was going to come back with us. Everything he does is an accomplishment." The 5-foot-10 Kuell downplays his return to competitive tennis. What else, he thinks, should he be doing? Still, there cannot be many high school players competing this spring who have had bone-marrow transplants. "He is a huge positive influence on the team," West Shore coach Jim Rossi said. Once a junior-tournament competitor, Kuell is perhaps through with team tennis after this season. He will attend the University of Florida next school year and study business. He has no plans to attempt to play for the Gators. "I want to play for fun," Kuell said. Even at Florida, Kuell, who lives with his parents in Melbourne Beach, will still have his blood checked every four months, plus take an annual visit to Minnesota for a bone-marrow biopsy. Although the blood problems were taken care of with the transplant, there is still the increased threat of cancer because of the Fanconi. "It still isn't over for him," Carol said. The disease was first discovered in Kuell about five years ago. His tennis coach, Tracy Singian, noticed he could not last as long in training sessions. One initial thought, Kuell said, was that he was merely fatigued from the end of football season (he played for a West Melbourne junior team). Blood tests, however, discovered the disease, which attacks the bone marrow and can also lead to leukemia. In 2005, the disease worsened, causing his blood counts to drop. "He was basically dying," Carol said. After the first donor was not able to donate, a second, a fireman from San Antonio, was found. Kuell first had chemotherapy to kill the rest of the old cells. 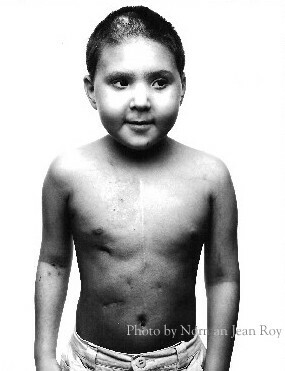 He then accepted the transplant, which entered the body through an IV. That was a critical time for Kuell, who was susceptible to numerous diseases and ailments because the white blood cells were temporarily gone. "He threw up a gallon of blood one night," said Kuell's father, Bill. Kuell had developed an ulcer. There were worries about infection and kidney and liver failures. Yet Kuell's health improved and he was finally released early last year. His parents spent the nine months with him in Minnesota, staying in an apartment. "While we were up there, we watched 10 kids die," Bill said. One oddity is that Kuell's blood type switched from O-positive to B-negative. "He's in better shape than before the transplant," Bill said. "He used to take tennis more seriously. Now, it's fun for him." Today Jack is starting out on his trip through the South with Aunt Jen, Uncle Dan, Hannah and a friend of Hannah's. On the first leg they'll be heading from St. Louis to Memphis. Jack's final destination is Nashville, and I think Jen, Dan, Hannah and her friend are going to keep going all the way to Atlanta before heading back to St. Louis. Along the way they are visiting important civil rights history sights, like Montgomery, Alabama, where Rosa Parks didn't move to the back of the bus she was riding, and the Edmund Pettus Bridge in Selma, Alabama, where black people who were marching for their civil rights were attacked by police. There is a new thing called My Maps on Google which I will use to show you their progress. This is the book we finally made for Mom. Her birthday is on Wednesday. She leaves for China on the next Thursday. Hopefully this will make the trip a little easier. Last night we were looking for some runs. Tonight we'll be looking for the Afikomen. This is our third straight Passover in St. Louis. We never visited when you were alive. We were doing too much traveling to hospitals and I think we were scared to be away from our home base. The last time we were here was for the World Series. So it was nice to go to Opening Day with Hannah and Aunt Jen. Uncle Dan had to be at a dinner for his work. The sad part was the Cardinals lost. But that's okay. We got to see the Budwesier Clydesdales, Bob Gibson, Lou Brock and Stan "The Man" Musial. And Jack and Joe and Hannah all got World Series hats that they were giving to kids. I remember getting "flip down" sunglasses as a giveaway at a Senator's game at RFK stadium when I was a kid. I used to think I was a big league outfielder when I was catching tennis balls we threw up high to ourselves in the cul de sac on Singleton Drive. Joe took the opportunity on the last night before Passover to knock back almost all of the baseball food groups - peanuts, hot dogs, Cracker Jack and cotton candy. He passed over the beer, so I took care of that. Here is some Cracker Jack information that I came across when I was looking for something online. Enough Cracker Jack has been sold that if laid end-to-end it would circle the Earth more than 69 times. -Cracker Jack is the world's largest user of toys. -More than 23 billion toys have been given out since 1912. -Some old Cracker Jack prizes are valued at more than $7,000. -A complete series of the 1915 baseball cards, original and in near mint condition, has been valued as high as $60,000. -The two men, Jack Norworth and Albert Von Tilzer, who wrote the song "Take Me Out to the Ball Game" in 1908, would not see a baseball game until years after they had composed their "baseball anthem." Norworth saw his first game in 1940 when the Brooklyn Dodgers honored him at Ebbets Field. Von Tilzer did not see his first game for more than 20 years after the song came out." -Cracker Jack," prior to being associated with the caramel coated popcorn and peanuts treat, was slang for something considered really great. Much the way people today use the word, "awesome," people then used the word "crackerjack." -During the Depression, the company that made Cracker Jack introduced many new products, although most of them enjoyed only a short period of popularity. New treats included Cracker Jack Cocoanut Corn Brittle and chocolate-covered Cracker Jack. -From 1941 to 1945, Cracker Jack became a national hero by supplying emergency field rations for the Allies during World War II. In fact, the company received three awards from the Army and Navy, including one for "high achievement in the production of materials needed by our armed forces."